The strength of a muscle is its ability to contract against great resistance. Strength is partly a matter of will-power, that is, of mental control over the muscles. Just the same, no man can make himself strong just by an effort of the will. The size of a muscle has a great deal to do with its strength. If there are two men of exactly equal measurements, the one who has the great amount of will power, or mental control over his muscles, will be the stronger of the two. Nevertheless, no slender, small-muscled man, no matter how great his mental control over his muscles, can hope to equal the strength of a man whose muscles are twice as big, and who has an equal control over them. There is a great deal of unnecessary mystery about this subject of "muscle control." It is one of the simplest things in the world. You have been exercising a while, and your arms have gotten considerably bigger and much more muscular than formerly. If you get into a discussion concerning muscular development you are apt to say to your opponent, "Well, feel my arm!" And as he puts his hand on your upper arm you bend your arm at right angles, and tighten the muscles of the upper arm so as to make it bigger and harder. That is "muscle control." Anyone can do it. If you will think back you will recall that every time you ask a friend to feel your arm you instinctively bend your arm all the way, so as to make the biceps muscles stick up in a large hump; but if you are experienced you know that if you bend the arm only at right angles it is possible for you to harden the biceps on the front of the upper arm and, at the same time, harden the triceps on the back of the upper arm; thus making your arm bigger than if you flexed and hardened only the biceps muscle. For many years it was a custom for a professional "Strong Man" to open his act by doing a few minutes' "muscle-posing" in a lighted cabinet. Such cabinets were usually made of a dark material, so as to make a contrast with the flesh of the athlete. At the top of the cabinet and out of sight of the audience were one or more very powerful lights, with reflectors so arranged that they threw a strong downward illumination on the body of the athlete. This strong light from above accentuated the shadows thrown by the muscles. In some cabinets it was possible to switch off the top light and turn on a light placed at the height of the athlete's elbow; and this light would throw shadows sidewise, and would bring out details of development which would not be revealed by a high light. The "Strong Man," standing on a low pedestal in the middle of a cabinet would strike one attitude after another, thereby displaying to the greatest advantage the prodigious development of his muscles. 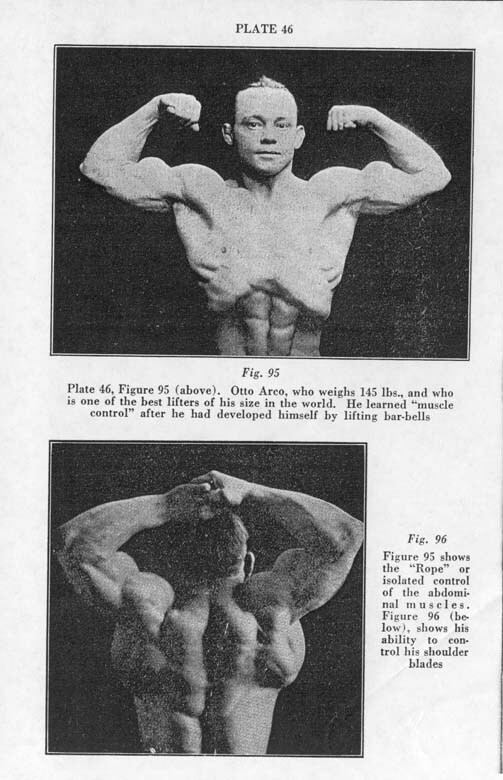 If you were so lucky as to see several different men pose you would notice that they all employed the same positions; that in order to show the biceps muscles to best advantage they would hold the arms in a certain position; that to show the abdominal muscles fully flexed they would bend their bodies in a certain way. There is a fixed routine of such positions or movements which is known to every professional and most amateur "Strong Men," and if you learn the positions and have sufficient development you can make a most amazing display, because as you go from one position to another different sets of muscles will be flexed, and huge bands and masses of muscle will appear on different parts of your body. The average reporter in describing such an act will say that the athlete's muscles moved about under his skin "like a mass of snakes writhing under a blanket." All this posing work is simply a matter of "muscle control." The fundamental principle of "muscle control" is, that before you can flex of contract a muscle to it fullest extent you must place the body of the limb in the most favorable position. For instance, if you hold your elbow at your side and double up the right arm you can make the biceps muscle very hard, but that muscle will not be fully flexed. If you put the right hand behind your neck, and raise your right elbow as high as you can, as in Fig. 91, you can flex the biceps muscle with much greater force, and it will be bigger than it is when the elbow is at the side of the waist. If you wish to get full control of your biceps you have to first raise your arm in this position. After the elbow is up, harden the biceps as much as you can. Then release the tension and your biceps muscle will become softer and the humped-up appearance will disappear. If you keep your elbow up, and flex and relax the biceps several times in succession, you will find that after a couple of weeks' practice you can make the biceps stand up in a much more impressive curve than it formerly did. When you have your elbow up, as in Fig. 91, you will find it impossible to harden the triceps muscle on the back of the upper arm, because that muscle has been stretched by bending the arm at the elbow. In order to get control of your triceps you have to stand with the hands clasped behind the hips, as in Fig. 91. In that position, if you press the elbows towards the back and press the hands outward, the triceps muscles will flex themselves, as shown in the picture. The moment you relax the tension the triceps muscle will relax and the back of the arm becomes perfectly smooth. That shows you the general principle of "muscle control" It is easiest for most physical culturists to control the upper-arm muscles, because most of their developing work has been devoted to the cultivation of those muscles; but when he tries to do the same thing with the muscles of his back, his chest, his abdomen and his legs he can't make nearly as good a display; because, in the first place, he does not know the positions most favorable to contraction (and therefore, for display); an din the second place his muscle are not big enough to be impressive even if he does learn how to contract them. Most of the large muscles on the body and the limbs can be brought under mental control just as easily as can the arm muscles. Fig. 93 shows an athlete with remarkably developed chest muscles. In this picture those muscles are relaxed, in fact, the whole body is relaxed, and this man's breast muscles are so large that they sag slightly of their own weight. Fig. 94 shows the same athlete with all his muscles flexed. you can hardly believe it is the same man, and the immense difference in his appearance is caused by an alteration in position and by "muscle control." The muscles on the breast bring the arms forward. In Fig. 94 the athlete is pressing his hands against each other with great force, and this has flexed the breast muscles and entirely altered their outlines. At the same time he has hardened the muscles on the shoulders, the arms and on the front of the abdomen. The beginner has to be satisfied with flexing one or two muscles at a time; but a bar-bell user, like this man, can instantly and simultaneously flex every muscle in the body. If you want to get control of your breast muscles you can do so by assuming the position sown in Fig. 94 and pressing the palms of the hands against each other. After a while you will get so that you can stand in a perfectly normal position and simply by thinking about it, harden the muscles on the breast and completely alter their outlines. But (and this is a very big "but") the flexed muscles will not look like much unless you have already made them big and thick by proper exercise. I have been familiar with the subject of "muscle control" for over thirty years. In 1893 I saw Eugene Sandow do most of the feats of "muscle control" that have since been done by other athletes. When Sandow was standing or sitting at ease his body and limbs, while of great size, were just as smooth as those of a Greek statue, although by a mere effort of the will he could make muscles stand out in knots and ridges all over him. Any other bar-bell user can do the same thing. After you get your muscles by work you can do marvels in the way of "muscle control"; but you cannot develop strong muscles or big muscles by simply flexing and relaxing them through an effort of the will. The best exponents of "muscle control" are former bar-bell users. The man who is best known as an exponent of "muscle control" was making lifting records several years before he advocated "muscle control" as a means of development. As far as I can see his muscles were just as big and just as much under his control when he was doing bar-bell work exclusively as they are today. Perhaps the most skillful man in this line is a lifter by the name of Nowielsky, who is known on the stage as Otto Arco. Figs. 95 and 96 show two of his "muscle control" stunts. In Fig. 95 he is showing the rope of muscles on the abdomen at the same time that he displays the muscles of his arms and shoulders. (By the way, he is the originator of this "isolated control" of the abdominal muscles.) Fig. 96 shows what looks like an incredible development of the muscles on the upper back, but part of the effect is obtained by his control over his shoulder blades. In this pose, by flexing certain muscles, he has spread the shoulder blades apart and changed the angle at which they are usually inclined. I give you my word that when this man is standing at a normal position, with his arms hanging at his sides, his back does not show these extraordinary contours. His back is very broad and packed from shoulder to shoulder with wonderfully developed muscles, but when he is not flexing those muscles, the back, while perfectly shaped, is not humped up with muscle. But when he raises his arm in the position shown, spreads his shoulder blades and flexes all the muscles on the upper back, he looks just as in Fig. 96. It is quite possible for you to learn to spread your shoulder blades just as he has done, and you may make your flexed muscles just as hard as his arm when flexed; but unless your muscles are fully developed you will not be able to duplicate the effect of his pose. Sandow used to say that, while on an exhibition tour, he never deliberately exercised. He claimed that the two exhibitions he gave every day afforded him plenty of hard muscular word, and that in between times he could keep his muscles in condition just by "flicking" them while sitting in a chair reading his newspaper. By "flicking" them he meant alternately flexing and relaxing them. I believe it is true that after you have developed your muscles you can keep them close to the highest pitch of development by practicing "muscle control" for a few minutes a day; but your muscles will not grow any bigger or stronger. "Muscle control" is all right as a means of displaying your muscles, but it positively is not a source of increased strength or development. I have seen skinny men practice "muscle control" stunts for months without adding one inch to the size of the chest, or as much as a quarter of an inch to the size of the arms or legs. True, they were able to make such muscles as they had stand out in knots. Anyone can do that if he can learn the correct positions. Your little brother can learn to control his biceps muscle by putting his arm in the position described in the first part of this chapter, but after he does flex the muscle it is just one tiny lump. On the other hand, if you, personally have big arms, a little practice in the proper positions will enable you to display your muscles to far better advantage than if you did not know these positions. In Fig. 97 you see what looks like two immense lumps of muscle projecting from each side of the upper back. If you stretch your arms straight above your head, as this man is doing, and then after the arms are straight, reach as high as you can with your hands, thus lifting the shoulders, your shoulder blades will spread apart. If you shoulder blades are covered with big, powerfully developed muscles you will look just as this man does; but if you have very little muscle on the upper back, although the edges of the shoulder blades will push the skin outward, your back will not look like the back in this picture. Before you can make any great muscular display through "muscle control" you must have the muscle to start with. The bigger and stronger your muscles are, the more you can do in the way of controlling and displaying them. (Referring back to Fig. 95 we see the one exception to the general rule. The ordinary athlete, when he wishes to play the abdominal muscles, leans slightly forward and contracts those muscles so that they appear in horizontal ridges, as in Fig. 34. This man, Arco, accidentally discovered that if the lungs were almost emptied of air there would be a partial vacuum created, and that when you flexed the front abdominal muscles the sides of the abdomen would cave in, as in the picture.) I consider that "muscle control" is valuable as a supplementary exercise, and that it is invaluable to the athlete who wishes to do muscular posing. Almost any exercise is good. Even "muscle control" has some value, because if you go through all the different positions which display all the different muscles in the body you get at least a little exercise out of it. There are some other details which may interest you. If you can control your muscles you can, in certain poses, produce some very pleasing effects. In Fig. 98 the athlete's back is very broad at the line of the arm pits and comparatively narrow at the waist. He had made his back broad by spreading his shoulders apart; but is should be noted that as he does spread the shoulders the muscles in the middle of the back seem to disappear. That man can deliberately press his shoulder blades together and make his back nearly six inches narrower than in this pose, and when he does bring his shoulder blades together in the middle of the upper back is covered with mounds of muscle. If he stands up in this position, and first spreads his shoulders and then squeezes them together, and repeats the motion a dozen times he is getting some valuable exercise for those muscles in the upper back which control these two motions. But again, the reason he can make himself so extraordinarily broad is because in the first place he has a big rib box, and in the second place his upper-back muscles are unusually big and powerful. If you can induce some thin man to try this stunt you will find that by pressing his shoulders together, then spreading them apart, the width of his back will be altered only an inch or so (that is, when he spread his shoulders his back is only an inch wider than when he squeezes them together). If you are lucky enough to get hold of an amateur "Strong Man" and bar-bell user (one of these chaps with a 44-inch normal chest) you will find that he can make a difference of 6 inches in the width of his back, according to how he holds his shoulders. The star of this stunt was Joe Nordquest. Fig. 99 shows his extraordinary ability to voluntarily broaden his upper back. You must remember that Nordquest's chest measure 46 inches normal, and that his upper arm measures nearly 18 inches. So if your chest measures only 36 and your arms only 13 inches, you must not expect to duplicate the effect that he gets. Most advocates of "muscle control" confine their practice entirely to the arm muscles and the abdominal muscles; whereas they could get very good all-around exercise if they devoted part of their time to getting control of the muscles on their back, their sides and their legs. If you stand squarely on both feet and then lock your knees back, you can harden the muscles on the front and outside of the thighs. If your thighs are of a fair size when you harden the muscles the thighs will assume the shape shown in Fig. 91; but if your thighs are thin, you can harden the muscles but the shape of the thighs will hardly be altered at all. The bigger and more powerfully developed the thighs are the more you can do in the way of mentally controlling your muscles. Mr. Max Unger, when doing cabinet-posing, could do more with his thigh muscles than any other man I have seen; that is, he could flex the thigh muscles in different ways, make them apparently jump up and down, and also move them from side to side without the slightest movement of the limbs themselves. He would stand squarely on both feet and make his thigh muscles move in a most extraordinary way, so that it seemed as though the muscles were being flexed by some outside power; whereas it was entirely a matter of muscular control. If Mr. Unger's thighs had been thin the movements of the muscles would hardly have been perceptible; but his thighs were of extraordinary size and power and beautifully shaped. It would take too much space to describe the several dozen positions which you must learn if you wish to get complete mental control of all the muscles in the body; but if you will observe the rule that you must first put yourself in a position that causes one muscle to contract, it is then easy to get control of that muscle. Some of you may have trouble in hardening the muscles on the front of your thigh when standing erect; although most of you will be able to do so if you make your legs perfectly straight and push the knees as far back as possible. If, however, you stand in front of a chair and raise the right leg and place the hell on the seat of the chair with your leg straight, you will find it very easy to harden the muscles on the front of the thigh. This is because one function of those muscles is to raise the leg forward. Similarly, if you want to get control of the muscle at the right side of the waist, you must bend the body over to the right, which contracts that muscle. After a few weeks' practice you will find that you can flex many of the muscles on the body without the necessity of bending the body from side to side. While seated in a chair you can, by a simple effort of the will, flex the breast muscles, or you can just as easily flex the big muscles on the upper back which lie close to the arm pit. You will be able to temporarily change the shape of your upper back through your control of the muscles which move the shoulder blades; but you must remember that it is far easier to learn mental control of a well-developed muscle than of one which is thin and undeveloped. I believe that one reason why bar-bell users have such "muscle control" is that their practice of lifting has developed extreme speed. This statement will come as a revelation to some of you who think that weight-lifting stiffens a man's muscles and makes him slow in action. That may have been true of the old-time lifter; but the modern lifter has to be as quick as a boxer with his hands and with his feet. In making what we call the "quick lifts," the lifter has to learn to entirely change his position in a fraction of a second. This would be impossible unless his muscles responded instantaneously to the message telegraphed from the brain through the motor nerves and to the muscles themselves. Recently I had occasion to take some photographs to illustrate some details of lifting. I had only an hour in which to get a model. The photographer happened to know of a hand-balancer who in his youth had gotten a fine development by using bar-bells. We telephoned the man and asked him if he was in shape to pose. He replied that although he had retired from the stage, and that it had been twelve years since he had seen a bar-bell, nevertheless, he was in perfect shape. A few minutes later he reported for the job, and stripped so that we could see his development. In order to prove that he was in condition he held up his right arm with the elbow slightly bent. There was not the least tension of the muscles of his upper arm, and the upper edge of the arm was perfectly smooth. He quickly flexed his muscles and his biceps simply leaped into a high curve. He did this several times in succession, contracting and releasing the muscles with such speed that the eye could hardly follow the movements of the muscles. When the upper arm is held out to the side and the muscles relaxed, the large muscle seems to be below the bone. That was the way this man's arm appeared before he flexed his muscles; but when he did flex his biceps the lower edge of the arm became taut, and the upper edge (the biceps) mounted in so high a curve that his arm was apparently two inches thicker than before. This man had never even heard the phrase "muscle control"; but the bar-bell training which he had done in his youth had given him a development which he had never lost, and a mental control over his muscles which he still retains, and which enables him to still flex any muscle in his body simply by concentrating his mind on it. I don't want you to take my word for all this, - I would like you to try it. If you have no development you will be sadly disappointed by your efforts at "muscle control"; but if you have big and powerful muscles developed either through the use of bar-bells or by other kinds of vigorous exercise, you will find that in a few weeks you will be able to do almost any stunt of "muscle control" that you have seen in a picture, or actually done by a "Strong Man." I have, at various times, been paid visits by lifters and bar-bell users who were interested in the subject of "muscle control," and invariably, in the course of half an hour, I have been able to show them how to learn to control their muscles. Those men already had the development and the mental control, and all I had to do was to show them the positions. On the contrary, I have never been able to do this with an undeveloped man, because such a man is handicapped by the fact that he has no muscle to speak of, and cannot control what little muscle he has. "Muscle control" is a thing that comes to you while you are developing the muscles; but it will not create muscular tissue nor will it make you any bigger or stronger.